Twenty four selected AU PSD officials successfully completed intensive training programme on Operational Planning and Budgeting of Programmes from April to May, 2013 at the Institute of Diplomatic Practice and Development Policies (I – 2DP) in Accra. The resource persons for the training programme were Messieurs Alexander Kwame Archine and Gilbert Atta Boakye with Ambassador Nana Bema Kumi as the Course Director. Their presentations were both original and well researched, spiced with their experiences over the years in the related fields of Finance and Development. From their oral and written assessment, participants rated the delivery by the two resource persons as being ‘Very Good’ and ‘Excellent’. 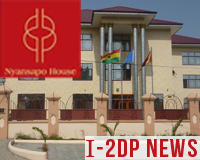 I – 2DP began this year’s training programmes from 17th to 22nd March, 2013 at the Nyansapo House in Accra with mid-career diplomats and officials. Eleven ghanaian participants, who were from the Ministry of Foreign Affairs and Regional Integration and the Ministry of Finance and Economic Planning were joined by one participant from the Sierra Leone Foreign Ministry. They were instructed by highly qualified professionals. Highlights of the programme included an address on ‘The Overall Japan-Africa Relations: With Eyes on TICAD V” delivered by former UNESCO Director-General, Ambassador Koichiro Matsuura at the Accra International Conference Centre. Presentations were made on New Approaches to Development Policies; Economic Diplomacy; the Politics of Integration and The Art of Negotiations. The programme ended on the high note of an address by the Deputy Commandant of the Kofi Annan International Peacekeeping Training Centre, Brigadier-Gen B F Kusi, on the all-important subject of ‘Peace and Security in Africa’. In 2013, I – 2DP began its efforts at capacity building in diplomatic practice for African officials with a course directed by the Executive Director of I – 2DP, Ambassador Nana Bema Kumi in February, 2013 at the African Centre for Peace and Security Training (ACPST) which is within the Institute for Security Studies (ISS) in Addis Ababa. The twenty-two (22) participants from seventeen (17) African countries were addressed on the core subject of Strategic Negotiations with emphasis on Climate Change Negotiations, Arms Trade Talks, Conflict Resolution Negotiations as well as Natural Resource Contract Negotiations by seven resource persons from different African countries and the African Diaspora. The Governing Board of I – 2DP held its fourth meeting on Thursday, 10th January, 2013, in Accra under the Chairmanship of Ambassador James Victor Gbeho. I – 2DP’s Business Plan for 2013 and Beyond was adopted. The Institute’s report on its visit to Mauritius in November, 2012 was analysed and a Plan of Action for the realisation of its objectives was adopted. A firm decision was also made to put in place a modern Library at the Institute that would make I – 2DP an automatic point of reference. Following a thorough research into establishing an integrated approach to development in Ghana, I – 2DP came to a conclusion that the need for a more effective collaboration between government and the private sector was imperative to help remove a number of challenges impeding Ghana’s strides towards the achievement of sustainable development. In its search for a possible economic model which addresses that development phenomenon, I - 2DP was motivated to undertake a working visit to Mauritius in November 2012. An African country with impressive economic development indices, Mauritius’ economic success has been mainly achieved through a well crafted and rigorously executed collaboration between the public and private sectors. The visit, which was effected by the Head of the Development Section of I – 2DP, Mr Alexander Kwame Archine, concentrated on the two main areas of Public /Private Partnership and Corporate Social Responsibility and how the two impact o the socio-economic well being of the citizens. I – 2DP intends to share the findings of the visit to Mauritius with key stakeholders in Ghana and generate a discussion which will eventually yield good and practical ideas on the way forward for Ghana’s economic development.